Side, which is 7 km from Manavgat and 70 km from Antalya, is an ancient living center whose name meant pomegranate in Anatolian language. Side, which is aforecited by historians as being founded in 1405 A.D., had been ruled by the Lydians, Persians, Alexander The Great, Antiogonous and Ptolemaioses in turn, beginning from the second half of Vith century A.D. After 215 A.D., the city, which had amended thoroughly under observation of Syrian Kingdom, turned into a scholarly and cultural center in this duration. Having been left to the Bergama Kingdom as a consequence of the Apameian agreement, the city later protected its freedom along with the Eastern Pamphilya region. The city soon flourished, gaining tremendous wealth and riches with a huge commercial navy. It entered Byzantium rule after Roman rule after 78 B.C. Side, which was a Pontiff center during V’th and VI’th centuries, had lived its biggest times during these years. The main gate of the city, which has a unique exertion, lies between two towers. There are two main streets in the Side province. These streets are typical examples of the columned streets from the Ancient Age. After passing city gate, the flat stones adorned area is the starting point of this street. There are columned porticos beside both sides of these streets, and shops behind them. There is a “Nymphaeum”, the largest historical fountain of Anatolia, which is found against city gate, outside the bulwarks. A wide pool place is below this foundation. You can reach a monumental structure by passing through a street after the theater. This building with dimensions of 100x100m, is an agora, in which lies the Bazaar area of the city. This area is surrounded by porticos and there are shops on three sides of it. There is a Gymnasium, surrounded by porticos and composed of three halls, on the street to the south side of the Agora. in the main street on the north to south direction, there is an arched structure, which was constructed during Roman Period. importance of Side city’s theater, in connection with architecture, is its construction on arched places instead of the slope of a hill like other roman theaters. The theater, which is composed of three divisions: the cavea, orchestra and scene, is the biggest and most monumental one among the Pamphylia theaters, and has a capacity of 20.000 spectators. There are wide cemeteries outside of Side’s bulwarks, with the most important one of these being the western necropolis, which is 1.5 km away. There are also temples and aqueducts in Side. 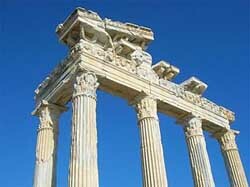 The most important temples in the region are the Athena, Apollon and Men temples. The water of Side is brought from the Dumanli source, within Oymapinar Dam Lake, almost 25 km away. This water transportation system is composed of ten aqueducts, of which some are two layered. The biggest one is near to Oymapinar and has 40 specs.